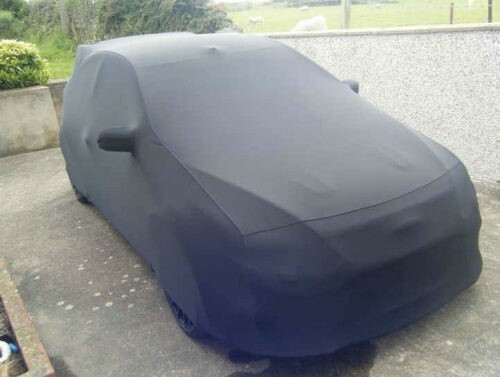 Cover Your Car - Tailored and Fitted Car Covers Worldwide :: Ford Fitted :: Ford Focus ( all versions ) :: Ford Focus inc RS and ST, GUANTO Soft, Stretch Indoor / Outdoor Bespoke Car Cover - Fully Fitted, made to order. 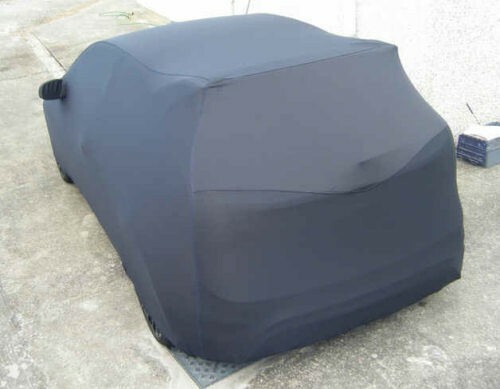 GUANTO for Indoor or overnight, short term outdoor use is a huge step forwards in terms of car cover fabric offering the same form fit, curve hugging shape as an indoor cover but outdoors. The fabric is stretch and both breathable yet waterproof thanks to its hi-tech inner membrane with millions of micropores, small enough for vapour to pass through yet too small for a water droplet. Each cover is custom made to order specifically for your Ford Focus and is available in either black or grey currently. We can also print onto this material and fit an alarm and pocket so you can protect your investment. The fabric is treated with UV inhibitors to help repel harmful UV rays, preserving the performance and quality of the cover but like anything that is left exposed to direct sunlight for extended periods of time, eventually some discolouration will inevitably occur. During extended sunny spells we advise that the cover is removed until needed. Any fading of colour will not affect the covers performance. If your car is being stored outdoor long term then something like an Advan-Tex or Cielo Custom Outdoor Specific would be more Suitable.